Caviart Ally and driver Andrew McCarthy showed why they were the best Wednesday afternoon as the pair won the 47th Jugette at the Delaware County Fair on Wednesday afternoon. In the $163,950 second heat, Blazin Britches (Trace Tetrick) and Caviart Ally used the inside positions that they earned in the eliminations to sprint out to the early lead as the field of eight passed the quarter mile pole in :27 3/5. Blazin Britches kept Caviart Ally behind her through the half in :55 4/5. McCarthy tipped the eventual winner off the rail at the three-quarters pole in 1:23 3/5. The crowd urged the pair down the lane and Caviart Ally cleared by ¾ of a length in 1:51 3/5. Obvious Blue Chip (Scott Zeron) rounded out the top three. New Zealand native Noel Daley trains the Bettor’s Delight filly for Caviart Farms. McCarthy, an Australian native, won the Jugette for the first time, capping a three win day at the Delaware County Fair. In the second elimination, Caviart Ally used the inside post and took control of the race and went by the ¼ mile pole in :27 1/5. Idyllic Beach (Yannick Gingras) was the first to challenge the pacesetter as the field approached the half mile station in :56 3/5. McCarthy asked his charge for more and Caviart Ally opened up at the three-quarters in 1:23 4/5. Caviart Lady won by 5 lengths over Tequila Monday (David Miller). Idyllic Beach hung on for third and Ella Christina (Tim Tetrick) advanced to the final with her fourth-place finish. The first $54,650 elimination went to Blazin Britches by 2 ¼ lengths over Obvious Blue Chip in 1:52 1/5. The Brian Brown trainee is owned by Emerald Highlands Farm. That pair hope to win today’s 72nd Little Brown Jug. McCarthy and Daley teamed up after their Jugette elimination win to take the $80,575 Buckette for three-year-old filly trotters. McCarthy used a perfect drive with Cool Cates to keep Satin Dancer (Ronnie Wrenn, Jr.) locked on the rail and sprinted home to win in 1:56. The Yankee Glide filly, a $35,000 yearling purchase, has now won more than $250,000 for the All Laid Out Stables. Seventeen three-year-old colt trotters competed in the $94,334 Ohio Breeders Championship. Trainer Chris Beaver swept the two divisions with Buckeye Boss (Aaron Merriman) in the first division and Fraser Ridge (Ronnie Wrenn, Jr.) in the second. Fraser Ridge established a national season’s record of 1:55 in the second $47,167 division with a 4 ½ length win over Full Surge (Mike Wilder). Fraser Ridge has won three in a row for Donald Robinson, Robert Mondillo, Beaver and RBH Ventures. Buckeye Boss took the second division in 1:55 3/5 over Jailhouse Sam (Hugh Beatty) and Dejarover (David Miller). The winner is owned by Beaver, Marion Beachy and Synerco Ventures. Three divisions of the $130,000 OBCs for freshman pacing fillies were held with Prsntpretynperfect taking the fastest division in 1:54 3/5. Prsntpretynperfect (Kayne Kauffman) overcame post No. 7 and was able to sit behind the leading Princess Rougarou (Yannick Gingras) until the final turn and sprinted clear to score by three lengths. The daughter of Big Bad John has now won six of seven starts this season for owners Jennifer Brown, Richard Lombardo and Joshua Green and trainer Brian Brown. Baron Remy (Chris Page) won the second $43,333 division in 1:54 4/5. Baron Remy belongs to Burke Racing Stable, Silva, Pumel & Libby, Lawrence Karr and Weaver Bruscemi. The nation’s leading trainer Ron Burke conditions the Yankee Cruiser filly. Pearl Crush (Ryan Stahl) took the first division over Shadows On Time (Ronnie Wrenn, Jr.) and Delicate Arch (Yannick Gingras) in a lifetime best 1:55 3/5. The Yankee Cruiser filly is conditioned by Ron Potter for Clyde Perfect. 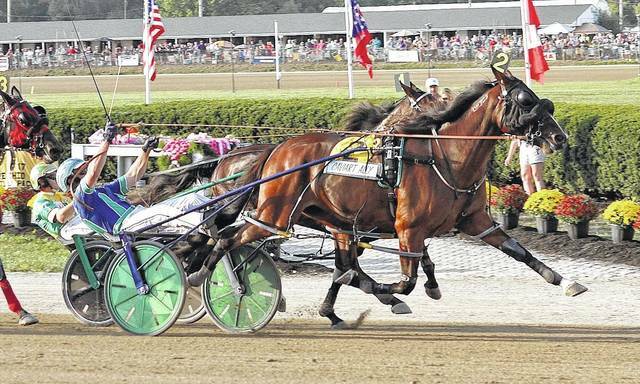 Two-year-old filly trotters competed in a pair of divisions of the $113,400 (div) Ohio Breeders Championships. The first division featured a classic stretch duel between Looking For Zelda (Tony Hall) and Risky Deal (David Miller). The Break The Bank K fillies were nose-to-nose through the lane with Risky Deal getting the last call in a lifetime best 1:57. To Russia (Ryan Stahl) used a final turn move to win the second $56,700 division in 1:58 2/5 over Red Storm (Aaron Merriman) and She’s Got Pizazz (Brett Miller). The Manofmanymissions filly now has $104,380 on her card for owner Parent Racing Stable and trainer Scott Cox. The $12,900 OBC for aged trotters went to A Tc Queenie (Dan Noble) in 1:54 3/5. The 4 year-old Triumphant Caviar mare is owned by Trish Soulsby and Richard Schault and trained by Ron Steck. The 22 race Jug Day card features the $590,400 Little Brown Jug. Post time is 11 a.m.
Caviart Ally defeats Blazin Britches to take the 47th Jugette Wednesday afternoon at the Delaware County Fairgrounds.